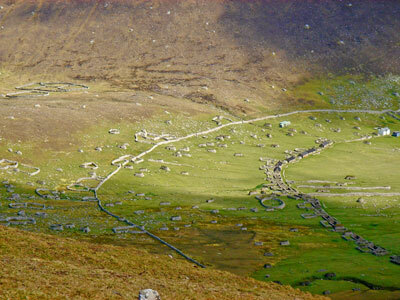 A string of wild islands lost in the North Atlantic, known as Saint Kilda reigned over the paradise of birds. Considered as inaccessible even to the most experienced sailors, protected by capricious winds and currents, their name was ever present on the long list of shipwrecks and maritime tragedies that occurred in that part of the desolate northern seas. They were known as "The Islands at the End of the World". The inhabitant's lived amongst millions of large sea-birds which, from time immemorial had taken residence on these islands: Sea gulls, gannets, albatrosses, petrels, guillemots, puffins, oyster-catchers. Their existence was based on the rhythm of life of these ocean-going birds which were the recognized masters of the inhospitable rocks subject to the constant anger of the elements. They ate bird meat and eggs taken from the hollows of the cliffs, eating them either fresh or up to eight months later. They sewed their shoes in gannets necks, the back of the head making a comfortable heel. Over years and centuries, the hearths were never extinguished as their living quarters, made of only mineral materials, took a long time to store up heat. Confronting powerful swells on basic crafts, they took their bearings from the flight-path of the birds they knew so intimately. 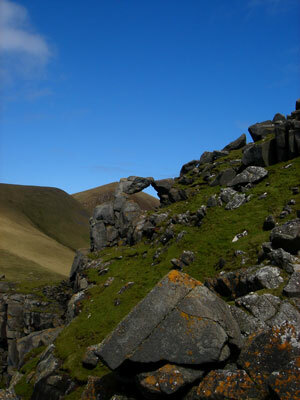 Their main activity was to hunt out nests in the steep cliffs and collect the eggs which were their staple diet. 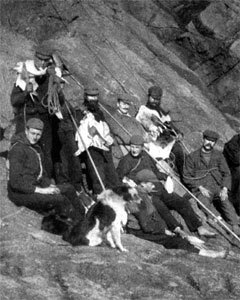 Climbing as a group, bare-footed even in hard frosts, linked together with a cord , fighting against the terrifying gusts of wind, they remained interdependant until death. Confidence in the other was the basis of their relationship. They could not have survived any other way. Their morphology adapted itself over the centuries to the harsh living conditions dictated by the extreme nature of the climate. Their ankles became very thick and their toes almost prehensile similar to those of climbing animals. They lived in perfect "collectivity". They installed two Parliaments, one for the men and one for the women. Every morning they organized the work for the day. They knew neither trees, war, writing, mirrors, money nor the personal pronoun "I". No "me", no ego, simply "us". They were "one" as a group and the individual was justified within the collectivity. Their religious practise, inherited from customs dating from the dawn of Christianity, was intertwined with elements of Nordic mythology (e.g. the myth of the Nordic Amazon). 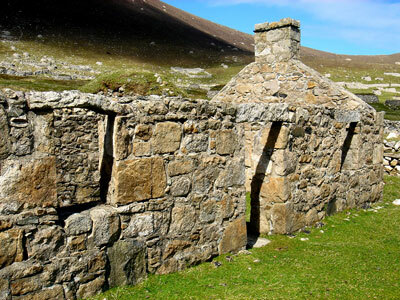 In the eighteenth century, a group of eighteen Saint Kildans landed on the island of North Uist in the Outer Hebrides. Questioned about their life, the eighteen men replied in perfectly synchronized chorus; not knowing the pronoun "I", they were only able to express themselves collectively. They lived, worked and thought together, one group in complete solidarity with each other. United in all their acts until death. They slept together on the same stone benches, huddled against the fire. Their words were also those of their fellows and, when questioned, they said that they often dreamed the same dreams. To others, strangers, they spoke in chorus. They did not see their own faces, they saw themselves only through the eyes of their companions. And the mirror was unknown to them ; there was no water surface calm enough to reflect an image so they did not know what they looked like. Their own face was that of the others. It wasn't until 1903 that a British Merchant Navy captain offered the first mirror to an inhabitant called Norman MacQueen. He kept the mirror secretly in his pocket only bringing it out to look at himself and confront his own reflection. The story goes that one day his wife surprised him hiding the looking-glass under the pillow. Thinking it must be the portrait of another woman, she surreptitiously looked, saw her own reflection and finding it not so pretty pronounced "Well, it's far from being beautiful!" The arrival of the mirror suddenly presented the look of the person holding it, sending him to thoughts of "me" in a community previously perfectly communist and unitarian where "me" did not exist. This marked the beginning of the disintegration of the society. No longer feeling the solidarity within the clan, the young left to seek their fortune elsewhere. Their natural resources had led them to believe that they were beautiful, happy and rich. The mirror and the mirage of civilisation made a quick job of correcting them.